← Blogger Intro: Preeti B. As we near the May 27th slate announcement of Silverdocs 2010’s documentary screenings, we’ll be bringing you a fusillade of announcements, giveaways, and — if our shipment comes through — candy. I digress. We now know that Magnolia’s Freakonomics will be opening the festival on June 21st and this is good news for anyone who has ever pondered the ins and outs of collusion in sumo wrestling, the inevitable life-arc that results from a particular name, crime in the ’90s, or whether bribing your kids is prudent parenting or pedagogy. 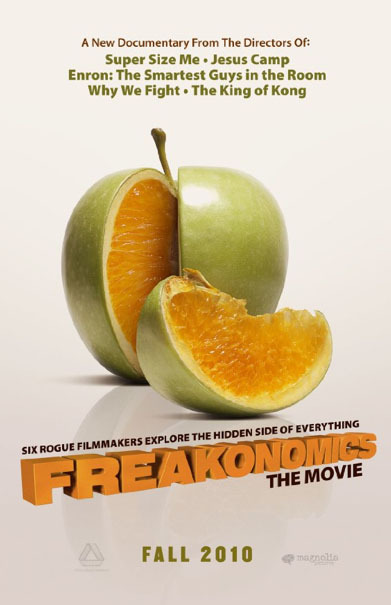 It’s also going to be a golden opportunity to see a documentary made by a crack team of some of the form’s most familiar faces, as the the doc — based on Steven Levitt and Stephen J. Dubner’s bestseller, Freakonomics: A Rogue Economist Exposes the Hidden Side of Everything — is directed by Alex Gibney, Morgan Spurlock, Rachel Grady, Heidi Ewing, Eugene Jarecki, and Seth Gordon. Welcome to the Thunderdome. Each filmmaker tackles a different chapter from the controversial book that applies statistics and psychology to break down and plum human behavior. With the amount of talent involved in the production, the highly anticipated feature is the perfect opening to what’s shaping up to be another watershed week of documentary film. This entry was posted in SILVERDOCS 2010 and tagged Alex Gibney, Eugene Jarecki, Freakonomics, Heidi Ewing, Magnolia Pictures, Morgan Spurlock, Rachel Grady, Seth Gordon, Stephen J. Dubner, Steven Levitt. Bookmark the permalink. What a great post…can’t wait to see this film! Indiewire is saying that the closing night film is “The Tillman Story.” True? And is closing night the 26th or 27th? Hey, I thought the notify date was yesterday? We did not hear back at all. Are you planning on sending out the emails on monday? The festival closes on the 27th of June. Sorry about the notification delay.